Pang Mipham Gönpo (Tib. སྤང་མི་ཕམ་མགོན་པོ་, Wyl. spang mi pham mgon po) was a student of Vairotsana. 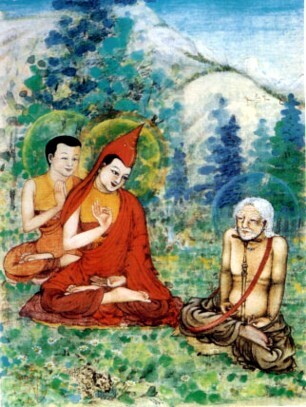 He was already eighty years old when he met his famous teacher but by practising diligently with the aid of a 'meditation support' he gained realization and ultimately attained the rainbow body. The Great Image: The Life Story of Vairochana the Translator, translated by Ani Jinba Palmo, Shambhala, 2004. Nyoshul Khenpo, A Marvelous Garland of Rare Gems: Biographies of Masters of Awareness in the Dzogchen Lineage (Junction City: Padma Publications, 2005), page 51. Patrul Rinpoche, The Words of My Perfect Teacher (Boston: Shambhala, Revised edition, 1998), pp. 312-313. This page was last edited on 15 November 2018, at 01:03.